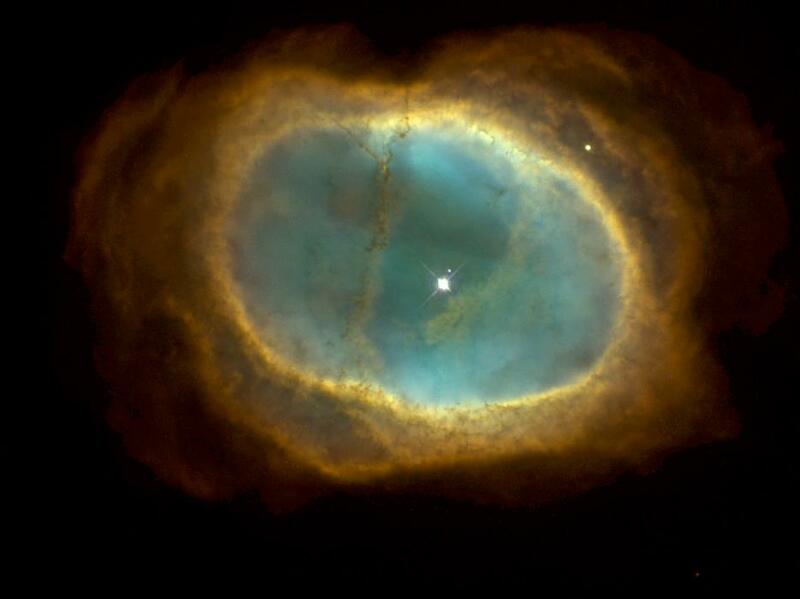 NGC 3132 is a striking example of a planetary nebula. This expanding cloud of gas, surrounding a dying star, is known to amateur astronomers in the southern hemisphere as the "Eight-Burst" or the "Southern Ring" Nebula. The name "planetary nebula" refers only to the round shape that many of these objects show when examined through a small visual telescope. In reality, these nebulae have little or nothing to do with planets, but are instead huge shells of gas ejected by stars as they near the ends of their lifetimes. NGC 3132 is nearly half a light year in diameter, and at a distance of about 2000 light years is one of the nearer known planetary nebulae. The gases are expanding away from the central star at a speed of 9 miles per second. This image, captured by NASA's Hubble Space Telescope, clearly shows two stars near the center of the nebula, a bright white one, and an adjacent, fainter companion to its upper right. (A third, unrelated star lies near the edge of the nebula.) The faint partner is actually the star that has ejected the nebula. This star is now smaller than our own Sun, but extremely hot. The flood of ultraviolet radiation from its surface makes the surrounding gases glow through fluorescence. The brighter star is in an earlier stage of stellar evolution, but in the future it will probably eject its own planetary nebula. In the Heritage Team's rendition of the Hubble image, the colors were chosen to represent the temperature of the gases. Blue represents the hottest gas, which is confined to the inner region of the nebula. Red represents the coolest gas, at the outer edge. The Hubble image also reveals a host of filaments, including one long one that resembles a waistband, made out of dust particles which have condensed out of the expanding gases. The dust particles are rich in elements such as carbon. Eons from now, these particles may be incorporated into new stars and planets when they form from interstellar gas and dust. Our own Sun may eject a similar planetary nebula some 6 billion years from now.